After watching game after game, at every level, we have come to the conclusion that the lay-up is the most neglected skill in basketball. Many modern players seem to have concluded that the only good lay-up is the jackknife half-gainer shot. This conclusion is wrong. The most beautiful lay-up is an orthodox one with a strong high jump and a kiss off the glass. The lay-up is a tough shot to make because every time it is used, the shooter is approaching the basket at a different angle and varying speeds. Besides that, there usually is a six foot six or a seven foot opponent waiting to jam it down your throat or swat it fifty feet up in the stands. In most instances, despite moving at a high rate of speed, the player must release the ball gently against the glass. Therefore, the first requirement for shooting good lay-ups is to eliminate all unnecessary movements. The layup should be a high jump rather than a broad jump; therefore, the body movement must be transferred upward, instead of forward. In order to achieve this, stretch out the last stride as the takeoff foot is planted and with the next step a shorter one, lift the jumping leg hard with the knee coming high as you can lift it. The ball must be protected from the opponent while shooting a lay-up. You accomplish this by shooting the ball with the right hand on the right side of the goal and with the left hand on the left side of the goal; however, there are exceptions to this rule. The baseline drive with the right hand makes it a necessity to come up on the far side of the basket with a right hand lay-up, or to shoot a left-handed lay-up on the right side. Aim the ball at a target. It is impossible to pick an exact target because of different approaching speeds and varying angles of approach; however, a general rule of thumb is a spot ten to twelve inches above and a bit right (if from right side, opposite if from left) of the rim. It is most important to look up at the target while concentrating on the shot. This makes it possible for the shooter to judge the best point of impact between the ball and the backboard. Whenever possible, in shooting lay-ups, shoot the ball off the board. We have never kept records on this, but it seems that shooting against the board seems to allow for more error in judgment than does the finger-roll laid over the lip of the rim, which must be flawless. · Grasp the ball firmly in both hands as right foot hits the floor. · Keep the ball between your body and the defender. · Whenever possible, use the board on every shot. · Eliminate all unnecessary motion. · Lengthen the last stride and plant the take-off foot firmly. · The last step is a short step which allows the shooter to convert his forward motion to a vertical jumping thrust. · Raise the jump foot hard and high. · Carry the ball in both hands as high as possible with right hand behind the ball, wrist cocked and facing the basket and the left hand in front. · Transfer the body momentum upward, not forward. · At the top of the high jump, both arms should be above the head with eyes fixed on the target, allow the left hand to fall away as the right arm, wrist, and fingers extends the ball against the sighting point. Do not make it a “vomit” shot (throw-it-up). Although these are seemingly the most primary drills, they should be part of every collegiate coach's important tools in teaching the game. Last week, I watched the University of Evansville Purple Aces pull off an upset of Drake University, last year's Missouri Valley Conference Champs. The Purple Aces play was outstanding, except for one thing: they missed eight lay-ups at the end of some pretty astonishing plays. Here are some drills for 7 to 10 year-olds that could help the Aces and many other Division 1 schools. Diagram 1 - Lay-up High jump without ball. the correct foot and elevating up instead of a broad jump. Players alternate from one side of the basket to the other. Players are at 45 degree positions with the basket and far enough away from the basket to take one step for imaginary lay-up. Explain to players to then bring the other knee up high and rising high as possible. The coach should ask if they feel themselves rising up in height. Also, you might ask them to try touch their nose with the knee. Diagram 2 - Lay-up High jump with the ball. This drill is performed much in the same manor as that described in Diagram 1, except it is done with a ball, but the shot is not released. Players, with a ball, alternate from one side of the basket to the other. Explain to players to then bring the other knee up high as possible. Explain the importance of keeping the eyes focused on a target on the backboard, above the basket. In this drill, the lay-up is not released. Diagram 3 - Lay-up High jump with the ball, banking the ball into the basket. This drill is performed much in the same manor as that described in Diagram 2, except in this drill, the shot is released at a target above the rim of the basket. Players are at 45 degree positions with the basket and far enough away from the basket to take one step for a lay-up. In this drill, the lay-up is released. Stress the old adage, "Never up! Never in!" Did you keep your eyes on the target? Diagram 4 - Lay-up High jump with the ball, cutting to the basket, catching the ball and banking the ball into the basket. This drill is designed to get players used to catching the ball while on the move, going up high on the proper foot and banking it off the glass and into the basket. Players alternate different sides of the basket and from different angles approaching the basket. Preach looking the ball into the hands, shooting off the correct foot, high jumping not broad jumping, keeping eyes on target, and never up! Never in! Diagram 5 - Lay-up from a dribble-drive. Youngsters should be encouraged to "be quick, but don't hurry" in this drill. Stress the importance of scoring at the end of each drive. Invariably the player that relaxes will make the most shots. Stress all the correct form, such as looking the ball into your hands, dribble with the outside hand, go up high on the correct foot, keep eyes on target, lay-up the ball against the glass above the basket, rebound the ball and overhand pass to teammate. Teammate executes in the same manner, rotating sides of the court. Diagram 6 - Fake and dribble drive lay-up. Place a youngster, with a ball, at each of the designated positions on the court. They rotate clockwise after performing their dribble drive. Place a chair, or cone, in front of each player. Have each player fake alternately right, then left, with a head and shoulder fake and foot fake before driving for the basket and a lay-up. Stress good and realistic fakes, dribbling with the correct hand, going high for the lay-up off the correct foot, etc. Emphasizing, never up! Never in! Diagram 7 - Competitive dribble drive lay-up emphasizing firm ball control drill. Many players lose control of the ball if bumped only slightly on the shot. Referees often don't see it and it costs many points. 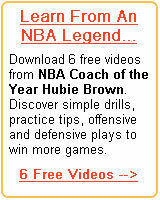 This drill is meant to help instill the habit of firm ball handling on lay-ups. Line up players facing the basket. This could be from all angles and changed frequently. Another line of players stands near the goal. Players break for the basket, one at a time, receiving a pass from the coach (or a third line). After the player receives the pass, he dribble drives and as he starts his lay-up, one of the players closest to the basket should push, bump, or hack him. Diagram 8 - Drill to detect open man from a lay-up dribble drive. Some players dribble drive out of control, much like runaway trains. This is good, only if they can spot teammates who are in a better scoring position. Place two offensive players near the basket, one on each side of the goal. Place two acting defense players, X1 and X2, on the inside, nearer the basket. Teach X1 and X2 certain hand signals, such as one or two fingers that indicates which one quickly moves out to a good defensive position, the other leaving his man open. Occasionally have both of them move into good defensive position. In the first instance the dribbler dishes off to the open teammate who takes the lay-up. In the later case, the dribbler takes the layup, himself. Diagram 9 - Drill to teach players to cut defensive players out completely if they can get one-half step advantage. Line players up as illustrated with the first one the designated defensive player, X1. On the signal, "Go!" the offensive player breaks across and toward the basket through the free throw area. The coach will pass to the offensive player after he takes one or two strides. The offensive player then swings in and cuts out the defensive player. He goes in for a left hand lay-up on the far side of the basket. Practice this from both sides of the floor. Diagram 10 - Competitive lay-up drill. Youngsters are encouraged to "make haste, slowly!" while performing this drill. Invariably, the line that relaxes most always will win the game. Divide squad into two teams, one at each end of the floor, in line and facing the basket. Put the starting player in each line exactly the same distance from the basket he is facing. On a signal, the first player in line dribble drives for the basket and a lay-up. After he scores, and he should get it in the basket before quitting. After succeeding, he passes back to the second player in line. The second player man not leave the starting line until the ball touches his hands. This continues until one line has scored twenty points with each goal counting two points. Both lines should shout out their scores of the moment. For example, if the first youngster scores all members of his line should shout, "two!" Change the angle of approach quite frequently.